M.P. Borys Wrzesnewskyj (Canada) spoke at a two day conference that brought together government and key non-government representatives from Ukraine, Canada, and the US to examine and evaluate two bilateral relationships that carry deep strategic significance and powerful cultural/historical meaning for Ukraine. The Ukraine's Quest for Mature Nation Statehood Roundtable Series began when a number of Ukrainian and American organizations convened in April of 2000, to consider ways to encourage a more engaged level of dialogue between the U.S. and Ukraine. Note: The written speech may differ from what was delivered at the conference. "Canada and Ukraine's Search for Security"
Compelling Bilateral Ties/US-Ukraine & Canada-Ukraine"
The 20th century saw two horrific world wars that destroyed over 100 million lives and produced some of humanity's greatest horrors: the sea of mud in which tens of thousands were mustard gassed in World War I, World War II's Auschwitz; we could go on. Both of these world conflagrations began in Europe, more precisely, in Central and Easter Europe, with attempts to change European borders by the force of arms. Subsequent to the horrors of World War II, we lived for over 50 years in a world of relative peace where world wars were avoided; a world in which Washington and Moscow, the two pre-eminent world powers, tested each other through revolutions, coup d'йtats, or proxy wars in Africa, Asia and Latin America. None of these led to a world at war as Europe remained in a "cold" peace. The genesis of this "cold" peace or "cold" war began with the appeasement of Yalta in 1945, which formalized the enslavement of half of Europe's people under the totalitarian communism of the Kremlin. This appeasement, at great human cost to the peoples of Eastern Europe, provided Western Europe the opportunity for economic rebuilding and democratic institutionalization. Soon after World War II, the myth of "Uncle Joe" Stalin as an ally was exposed. To counter Kremlin territorial expansion in Europe and to prevent a new European war, which would inevitably lead to a new global war, Canada and her American and European allies turned to the formation of new security arrangements. Canada's then Secretary of State for Foreign Affairs Louis St. Laurent underscored in a 1947 speech to the UN General Assembly the need for a defensive regional security organization under Article 51 of the UN Charter that would pool the economic and political resources of European and North American democracies, or as they became known, the North Atlantic democracies. St. Laurent passed the torch for the establishment of a North Atlantic Alliance to his then deputy Lester B. Pearson who rejected strictly military alliances in favour of a treaty amongst a group of democracies with similar creeds to "promote the economic well-being of peoples to achieve social justice… on the side of peace and progress." During the formative stage of development of the North Atlantic Treaty Organization, Canada attached great importance to an alliance which would embrace economic, social and cultural fields; a NATO which, in Pearson's words, would not be solely "an instrument of unimaginative militarism." Notwithstanding Canada's representations, when the North Atlantic Treaty was finally signed in April 1949, the Alliance's mandate focused on the military component, with the all-important Article 5 which stated "an attack on one or more shall be considered an attack against all…"
However, Canadians are proud of our contributions to this treaty, namely, Article 2, known as "the Canadian Article" which states that "the parties will…bring about a better understanding of the principles upon which their institutions are founded…will seek to eliminate conflict in their economic policies and encourage economic collaboration." Although Article 2 has been downplayed throughout most of the second half of the twentieth century, the reality is that NATO became the protective shield behind which an economic and political European Union eventually developed. In December of 1991 the world witnessed two major historical events in Europe: the signing of the Maastricht Treaty giving birth to the modern EU, and the overwhelming plebiscite vote for independence in Ukraine ensuring the demise of the Soviet Union. That particular month marked what initially appeared to be a final victory of a democratic, free market, collaborative vision over a totalitarian, communist, and imperialist vision for the future of Europe. With the collapse of the Soviet empire and the threat it posed, many openly questioned the need for NATO and especially NATO's further expansion; others sought to give NATO purpose by arguing in favour of a role for NATO in far from Europe theatres such as Afghanistan. Both of these lines of argumentation about NATO's future have now been discredited. One argues that with no Warsaw Pact, NATO is no longer needed for European security and peace; the other that since NATO's expanding defensive shield within Europe is not required, NATO's new role should be as an offensive army in distant lands that may pose threats to our member countries. Both of these arguments are based upon the assumption that the Russian Federation, the successor state of the Soviet Union, is now a nascent democracy and is neither a threat to European peace nor to world stability. Today, it is evident that the assumption of the birth of a nascent democracy upon Kremlin foundations in a benevolent Russia was naпve. Even former General Secretary Gorbachev has raised the alarm. In March of this year he stated that Russia is becoming a one party dictatorship, underscoring that the United Russia Party of Mr. Putin is "'a party of bureaucrats' and 'the worst version' of the Soviet Communist Party," noting that the "'electoral system has been utterly maimed'" and lamenting the multiple murders of prominent critics. However, it is the Kremlin's foreign conduct and the repeated use of armed force and war as an instrument of foreign policy that most clearly illustrates the threats to peace and security faced by Europe. After 50 years of peace in Europe, the Kremlin has spawned a sequential series of regional European civil wars and wars: the military conflict in the Moldovan region of Transdnisteria conducted by Russia's 14th Army Division; and, the multiple wars in the Caucuses, including the recent invasion by Russian Armed Forces of Georgia beyond Georgia's breakaway regions of South Ossetia and Abkhazia. Most worrisome is that these armed conflicts have had an escalating nature. Vladimir Putin's public expressions of neo-imperialistic intent have recently been formalized by the Russian Parliament, the Duma, into law. This past summer the Duma passed legislation which authorizes Russian military interventions in foreign countries when Russian citizens' rights are deemed under threat. This has been coupled by widespread granting of Russian citizenship and passports to Georgian citizens in Abkhazia and South Ossetia, and most ominously in Crimea, Ukraine. Unfortunately, as Ukraine, a fragile nascent democracy, has turned to NATO for its protective shield, European capitals are being intimidated and their energy security undermined by Russian natural gas shut-offs and blackmail. Meanwhile, key opinion leaders and decision makers such as former German Chancellor Gerhard Schrцder and former Shell CEO Jeroen van der Veer have become spokespersons for Gazprom through lucrative Gazprom-affiliate board positions and promises of corporate concessions for liquefied Natural Gas (LNG) on the Yamal peninsula. Interestingly, Mr. van der Veen has recently been selected to a high-level group supervising the writing of NATO's new strategic concept. It is time to return to the formative and visionary debates surrounding NATO's birth as expressed by Canadian Prime Minsters the Right Honourable Louis St. Laurent and the Right Honourable Lester B. Pearson: NATO as a shield behind which nascent democracies can be nurtured and economic collaboration flourish, rendering regional threats untenable militarily and economically irrational. At the present time, Ukraine seeks the protection of NATO's expanding shield knowing that the economic and political benefits of European Union membership will surely follow NATO security membership. These were the reasons that former Warsaw Pact countries, former Soviet Baltic Republics, and the newly independent states in South Eastern Europe, joined NATO. They were proven correct. Today it is NATO's expanding shield which is the organization's raison d'etre, providing regional security and geopolitically stability. NATO's expansion to embrace Ukraine will limit the Kremlin's opportunities to follow its historical instincts to rebuild empire. With no opportunity to rebuild empire, Russia may reverse herself from traveling down the path of neo-dictatorship and neo-imperialism, and may eventually come to see her future within a North Atlantic Alliance of democratic free enterprise countries as well. Moreover, Ukraine is not peripheral to Canada's interests. In fact, Canada has a formal "special relationship" with Ukraine. There is unanimity among Canada's political parties in support of Ukraine's democratic processes, market reforms and Ukraine's joining Canada in our NATO family. Just this past September Canada signed a Memorandum of Understanding to begin the process which will culminate in a Free Trade Agreement with Ukraine. Several other examples will help to illustrate Canada and Ukraine's "special relationship." Since 2005, one of the largest and most dynamic parliamentary associations in Canada's Parliament has been the Canada-Ukraine Parliamentary Friendship Group, whose membership includes parliamentarians from all political parties. 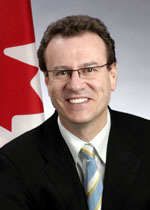 In a January 2009 statement on ratification of NATO accession protocols for Albania and Croatia, Canada's Foreign Affairs Minister underscored that the ratification of these protocols "sends a clear message that will inspire other NATO aspirant countries to continue on the path of integration and reform," while our Defence Minister stressed that the "addition of new members strengthens Euro-Atlantic security." Along with public statements of political intent, Canada has provided concrete opportunities to make Ukraine's eventual accession to full NATO membership a reality. Along with the Lithuanian and Polish militaries, Ukraine's military has participated in the international peacekeeping exercise Maple Arch with Canada's Training Assistance Team deployed to assist these three countries to prepare their militaries for rotation in peacekeeping contingents that are involved in operations under the auspices of NATO. The 2004 Maple Arch program was conducted in Ukraine. Its aim was to "train the trainers" within selected Lithuanian, Polish and Ukrainian military units focusing on company level officers and NCOs. Colleagues, in the 20th century two world wars had their origins in European regional conflicts. During World War II Ukraine lost over 12 million of her people; a price in human lives higher than any other country on the planet. Today, one of Europe's most dangerous geopolitical fault lines runs through Ukraine and coincides with an increasing neo-imperialist appetite at the Kremlin. The only way we can successful erase this geopolitical fault line is to embrace Ukraine's entry into NATO and subsequently into the European Union. Currently only four post-Soviet republics can be considered nascent democracies: the three Baltic states and Ukraine. The security and democratic futures of the three Baltic states have been secured with NATO and EU membership. Ukraine cannot and should not be left out in the cold. I began my discourse by referencing the horrors of the two world wars which took the lives of over 100 million people in the 20th century. As I stated, both of these conflagrations began in Europe, and more precisely in Central and Eastern Europe. Let us not relearn the lessons of history. European peace and global security will be decided by our willingness to take a principled stand on Ukraine. As American, Canadian and international experts gather to share their views on the bilateral USA-Ukraine relationship and the bilateral Canada-Ukraine relationship on Ukraine's Quest for Mature Nation Statehood, it is important to note that Canada's government and Canadian parliamentarians continue to stand firmly in support of Ukraine's Euro-Atlantic aspirations. Let me reassure you that Canada remains ready and willing to support Ukraine and the historic choice she faces. Tony Halpin, "Kremlin Rigged Russia's Regional Elections, Says Mikhail Gorbachev," Times Online, 20 October 2009, at: LINK. "Address by Borys Wrzesnewskyj, M.P. (Etobicoke Centre): Ukraine's Euro-Atlantic Future Forum II (Kyiv, June 2, 2008), LINK also available at LINK. Government of Canada, News Release, "Canada Ratifies NATO Accession Protocols for Albania and Croatia," 14 January 2009, LINK. Government of Canada, News Release, "Prime Minister Harper Backs Ukraine's Progress Toward NATO Membership," 2 April 2008, LINK. Marco Levytsky, "Ignatieff Pledges Commitment on Key Issues," Ukrainian News (Edmonton), 5-17 March 2009, p. 1. Cf. Borys Wrzesnewskyj, "Liberal Leader's Policies Win Over Skeptics," Edmonton Journal, 13 March 2009, p. A19, LINK. "Ignatieff Would Push U.S., U.K. for Security Guarantees Should NATO Not Go Through," Ukrainian News, 5-17 March 2009, p. 3. Governor General of Canada, News Release, "Productive Dialogue Between the Governor General and the President of Ukraine in Kyiv," 23 April 2009, LINK. See "Directorate of Military Training Assistance Programme: Active MTAP Member countries" at: LINK and H.E. Ambassador Ihor Ostash, "Assessing Ukraine's Relationship with Canada," remarks delivered to the symposium "Ukraine's Euro-Atlantic Future: International Forum III," March 31, 2009 (Brussels), available at: LINK. "Ukraine, Canada to Develop Military Cooperation," Press Release, April 23, 2008, wbsite of the Government of Ukraine at: LINK.